Wolf Lodge Bay is alive with bald eagles that have migrated to the northeast corner of Lake Coeur d’Alene to feed on spawned-out and dying kokanee. U.S. Bureau of Land Management staffers counted 83 bald eagles hanging out in the trees around the bay during a weekly survey Tuesday. Despite poor sighting conditions, the Tuesday survey indicated a decline from the 127 eagles counted during the same week last year, said Carrie Hugo, BLM wildlife biologist. 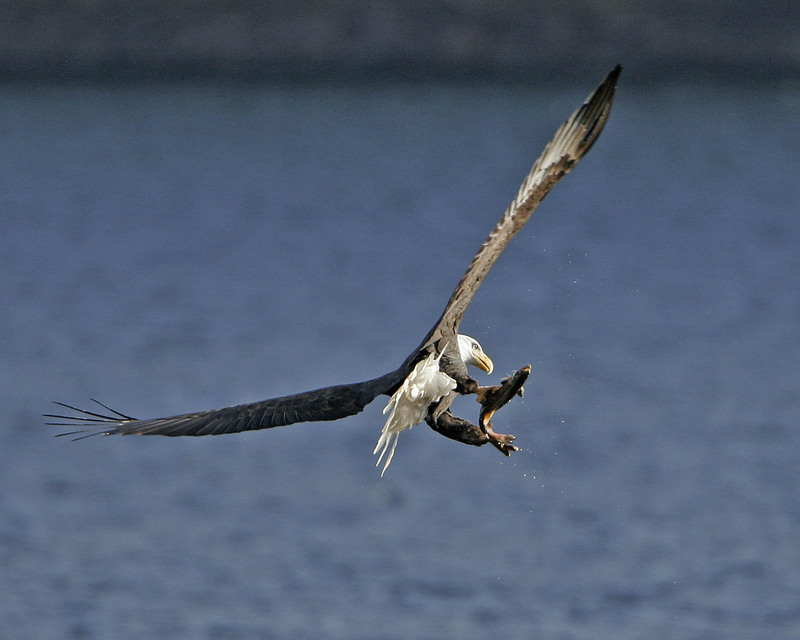 Hugo had counted 66 bald eagles around Wolf Lodge Bay on Dec. 2, down from 88 in the same week last year. The birds of prey are lured to the Wolf Lodge Bay area starting in November as kokanee crowd into the creek and gravel bars to spawn. “Idaho Fish and Game was out sampling the kokanee and it looks like the spawning peaked this week,” she said. A record 156 eagles were counted in late December 2004, when the highest eagle concentrations were still occurring the week before Christmas. However, the annual eagle congregation seems to be dwindling and dispersing sooner compared with previous years, prompting BLM and volunteers to move up the dates for the annual Eagle Watch activities, which start next weekend. Last year the number of eagles dropped from 127 on Dec. 8 to 67 in the second week of December, BLM records show. Wildlife biologists and volunteers with spotting scopes and eagle information will be stationed around the bay Friday through Monday, 10 a.m.-3 p.m.
Access the area from Interstate 90 east of Coeur d’Alene by taking the Wolf Lodge exit. Look for educational information at Mineral Ridge Boat Launch and Mineral Ridge Trailhead. Another Eagle Watch week is set for the traditional dates of Dec. 26-29, but the trend in recent years has been for fewer eagles to be in the area by late December. Since 1994, when BLM began surveying the people as well as the eagles that come to Wolf Lodge Bay in November and December, more than 50,000 visitors have come to watch during the Eagle Watch weeks. Although 70 percent of the eagle watchers drive less than three hours to make the visit, the other 30 percent have come from far-flung places, including all 50 states and 36 foreign countries, BLM data show. Many of these out-of-area people are visiting local family and friends. Many are exchange students or tourists on skiing vacations.